What are the causes of ingrown hair cyst? How to get rid of ingrown hair cyst at home? What you can do to prevent ingrown hair cyst? An ingrown hair pertains to the backward curling of hair into the skin or on the surface of the skin that develops into small swelling-like pimples. The condition is called ingrown hair cyst. An ingrown hair cyst affects the hair follicle. 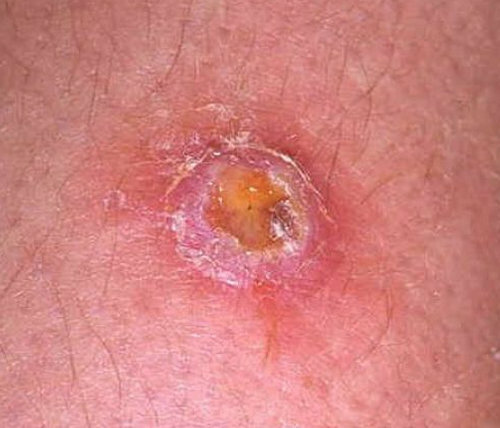 It is known for other names like folliculitis, pilar and isthmus-catagen cyst. Can a simple ingrown hair turn into a cyst? Well, it all starts with an infection. The ingrown hair begins to pop discharges causing to pain and discomfort. It is important to get rid of the cyst as soon as possible to avoid worsening of the condition. A fluid sac that appears yellow or white. When the color turns to green, it means that it is already infected. Tea tree oil – It is one of the natural treatments for ingrown hair cysts. It can help get rid of the infection because of its anti-inflammatory and antibacterial property. Add a few drops of the oil to a little water. Use the solution to clean the affected area every day. Leave the solution for a few minutes and rinse with lukewarm water. Aloe Vera – This plant has long been used for maintaining hair and skin health. Put a few drops of aloe vera to the cyst to help fight the infection and speed up the healing process. Prescription creams – Dermatologists usually recommend steroids to alleviate the pain, swelling, and itching. A topical steroidal cream alleviates mild to moderate inflammation. It also reduces itching and irritation. For severe cases, the best option is oral corticosteroid such as prednisolone and hydrocortisone. Corticosteroids have side effects and so it should only be used upon the prescription of your doctor. Antibiotic pills (5) – If you use prescription creams and there are side effects, the doctor usually recommends antibiotic pills. An antibiotic cream can be prescribed too depending on the severity of the condition of the patient. Pain medications – Ingrown hair cyst can be painful, especially in severe cases. The pain is intense if the cyst is located in areas like armpit and pubic area. To alleviate the pain, you should take over the counter pain medication like ibuprofen. A high dose of pain killer should be used for intense pain. However, you will need prescription from your doctor as high dose pain killers cannot be purchased over the counter. Tretinoin (4) – It is a form of vitamin A, which helps renew the skin cells. It reduces skin plugging and gets rid of accumulation of dirt and dead skin cells thereby reducing the chances of ingrown hair cyst. Injections – If the cyst is infected, an injection is given to prevent worsening of the condition. Not receiving the right treatment could lead to secondary infection. Patients are usually given an injection of antibacterial solution or retinoid solution. Anti-acne drugs – Acne creams help in preventing the formation of scars. Most anti-acne drugs contain salicylic acid, which helps exfoliate the skin. It dries out the cyst and eventually get rid of it with long term use. When all other treatment methods fail, the last resort is surgery. Ingrown hair cyst, especially if large in size can cause aesthetic discomfort. Hence, it should be removed through surgical approach. Other way of removing it is through laser surgery technique. When shaving, make sure you are going to use clean and sharp razors. Observe the proper shaving technique. If you have a sensitive skin or super soft skin, you have to apply a cream or skin conditioner prior to shaving for easier hair removal. Avoid shaving against the grain. The direction of your shave should be into the direction of the hair growth. Keep the razor clean before and after use. By doing so, you will be able to avoid build-up of infection-causing microorganism. As much as possible, use fewer stroke when shaving. Make it a habit to exfoliate your skin to get rid of dead skin cells that may cause the hair to be clogged beneath the skin’s surface. You should keep the skin clean at all times. Do not scratch the skin using your nails, especially when the irritation occurs after shaving.